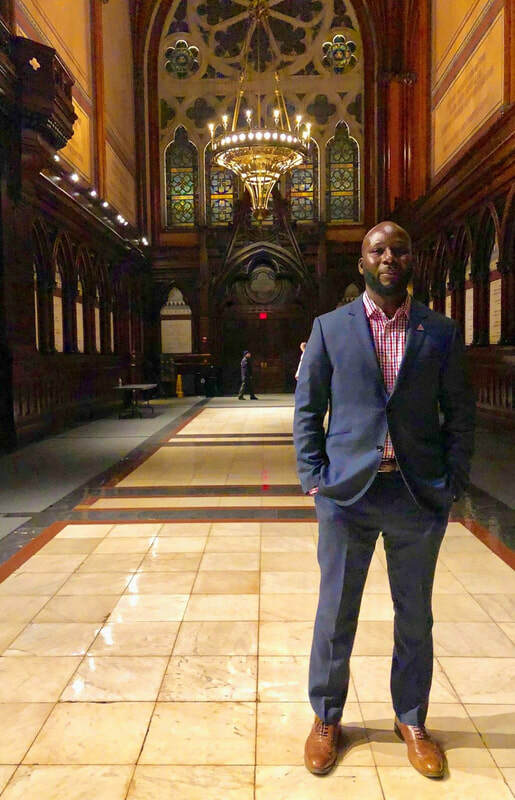 Darren Mack was born and raised in Brooklyn, New York in a community that was plagued with a high concentration of poverty, substandard schools, and high rates of unemployment among Black and Latino males. In 1992, at the age of 17, Darren was arrested for being an accomplice to a robbery and was ultimately sentenced to 20 to 40 years in New York State prison system. His first time in the prison system, Darren served a total of 20 years straight. During his incarceration, Darren had his life changing moment when he received a letter from his cousin that informed him about a distant relative by the name of George Stinney Jr. who was also impacted by the criminal justice system. In 1944, George was wrongly convicted and found guilty by an all-white male jury in a racially-biased trial in South Carolina. George was sentenced to death and was executed by the electric chair. George was only 14 years old. Darren wanted to learn more about the case, which led him to become interested in U.S. History. He became an avid reader particularly interested in issues related to race, class, and gender. Several years later into his sentence, Darren was accepted into Bard College's Bard Prison Initiative. After being released in 2012, Darren graduated on Bard College's campus with a B.A. degree in Social Studies with the class of 2013. Since his release, Darren has been actively engaged in working to dismantle New Jim Crow practices. He became a member of the Education From The Inside Out Coalition working to remove statutory and practical educational barriers for individuals impacted by the punishment system. He advocated in front of the Black, Puerto Rican, Hispanic & Asian Legislative Caucus to push legislation to Ban The Box on college admission applications. Darren also advocated in front of the SUNY Board of Directors with members of the EIO Coalition. In 2016, SUNY decided to Ban the Box across all their campuses. Darren is an active member of JustLeadershipUSA. He was honored in 2016 to be an Emerging Leader recipient from JLUSA. In April of 2016, he became one of the outspoken advocates and organizers for the Close Rikers Campaign. His experience on Rikers was covered by Mass Story Lab at The New School and other periodicals. In 2016, Darren was accepted into and completed a fellowship program with the New York Civil Liberties Union- Community Organizing Institute. He was also awarded with the very first Lawrence "Larry" Gelber Award for Justice in 2017 by JLUSA. He was a panelist at the first Beyond the Gates conference at Harvard University. Darren worked as a Project Coordinator for the Beyond the Bars Fellowship in the Center for Justice at Columbia University. He is now a full time graduate student studying Community Organizing and Policy at Silberman School for Social Work.